Frankly, this is pathetic. If Bernanke and his minions can’t take the heat of some well-deserved criticism from the highly-regarded Martin Wolf of the Financial Times, they don’t belong in public service. Policymakers must distinguish two objectives: the first is macroeconomic stability; the second is a sound financial system. These are not the same thing. Policymakers must not only distinguish these objectives, but be seen to do so. The Federal Reserve failed to do this when it issued statements, on prospects for the economy and on emergency lending, on August 17. This unavoidably – and undesirably – confused the two goals. Enter Greg Ip of the Wall Street Journal. Ip is widely considered to be a preferred, if not the preferred, outlet for informal communications from the Fed. Bernanke is showing signs of a break with Greenspan by distinguishing between the Fed’s two main roles of maintaining financial and economic stability. This is a direct rebuttal to Wolf, editorializtion masquerading as news. To Mr. Greenspan, market confidence and the economy’s growth prospects were so intertwined as to make the Fed’s two duties almost inseparable. He cut rates after the 1987 stock-market crash and the near-collapse of hedge fund Long-Term Capital Management in 1998 to prevent investor reluctance to take risks from undermining the nation’s economic growth. By contrast, Mr. Bernanke distinguishes between the central bank’s two functions. So, on Aug. 17, the Fed cut the interest rate and lengthened the term on loans to banks from its little-used discount window in hopes banks would use the window — or at least the knowledge it was available — to lend to solid borrowers having trouble getting credit amidst the market turmoil. The action was aimed at restoring the normal functioning of disrupted credit markets, not primarily at boosting growth. Ip should be too seasoned a Fed watcher to buy this bunk (although some have suggested he serves as a scribe for the Fed). And it goes without saying that the existence of Wolf’s piece is never mentioned. The discount window was not an effective mechanism for dealing with the seize up in the money markets, which was where the crisis lay. That problem resulted from a repudiation of asset backed commercial paper, which potential buyers feared might be tainted by subprime exposure. Many of the issuers who couldn’t roll it were either corporations or special purpose entities that had no access to the bank discount window. Thus Bernanke’s move was no remedy. 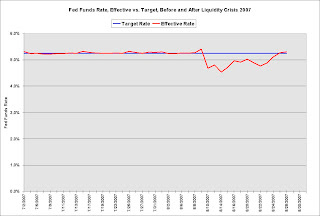 As we said at the time, the important act that day was not the discount rate cut, which was merely symbolic, but the Bernanke commitment via Dodd, that the Fed stood ready to act, which traders have taken as a promise that a Fed funds rate cut is soon coming. In fact, our reaction on August 17 was that Bernanke’s actions showed him to be the true heir of “Greenspan put” Al. But Ip would have us believe otherwise. Calculated Risk notes that this de facto easing is much less than during the 9/11 period. So we can either believe Ip is an idiot or he is so loyal to his Fed sources that he will take a story line from them and faithfully write it up. I’m inclined towards the latter view. And if true, that is even more discouraging that what Wolf told us yesterday. This entry was posted in Media, Politics, regulation. Bookmark the permalink.